American Myth and Memory at the Smithsonian American Art Museum in Washington, D.C. is a wide-ranging exhibition of Levinthal’s photography. Populated with toy cowboys and cavalry, Barbie dolls and baseball players, David Levinthal’s photographs reference iconic images and events that shaped postwar American society. Despite their playful veneer, Levinthal’s images provide a lens through which to examine the myths and stereotypes lurking within our most beloved pastimes and enduring heroes. In doing so, Levinthal encourages us to consider the stories we tell about ourselves—what it means to be strong, beautiful, masculine, feminine, and ultimately, American. The exhibition will run June 7-Oct 14. John Dempcy was one of the 2018-19 grant recipients from the Pollock-Krasner Foundation. The grants provide support to artists for the creation of new work. The Pollock-Krasner Foundation, Inc. was established in 1985 through the generosity of the late Lee Krasner, a leading abstract expressionist painter and widow of Jackson Pollock. MAMBO’s permanent collection is impressive, and features over 4,300 artworks dating from the end of the 19th century to today by significant Colombian and international artists. In addition to the Gary Komarin painting, the museum owns artwork by Pablo Picasso, Francisco Goya, Auguste Rodin, Joan Miró, Salvador Dali, Andrés de Santa María, Ricardo Acevedo Bernal, Fernando Botero, and Alejandro Obregón. See the available Komarin paintings here. American Art Collector Features Jennifer Nehrbass' "Pioneer Project"
The exhibition at JNG runs March 1-26. The publication says “The women she depicts in the series are bold, chic and confident”. Click here to see the paintings in the exhibition. 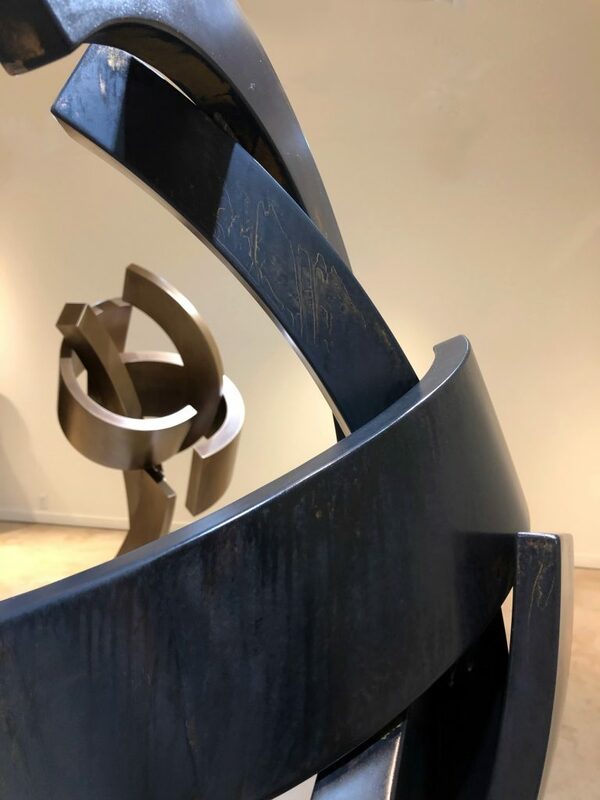 “The artist Guy Dill has carved out a unique niche for himself on the borderline between abstract and figurative sculpture.” You can read the full article here. Teresa discusses how her new paintings symbolize a "worship of beauty in chaos". Read the full article here. See the new paintings here. Our newest addition to the gallery, Guy Dill is a renowned American sculptor. Both his bronze and marble sculptures while not figurative, often suggest the lines, curves and lithe swoops of bodies and movement itself. His works are included in many important museum, public and private collections, including: the Museum of Modern Art, NYC; Solomon R. Guggenheim Museum, NYC; Whitney Museum of Art, NYC and the Smithsonian Institution, Washington D.C. We have just received the sculpture featured above and we will be having a solo exhibition for him in February, 2019. See the available sculpture here. Since the mid-1970's David Levinthal has been exploring the relationship between photographic imagery and the events, characters, myths and fantasies that shape American culture. In 1978, the George Eastman Museum (Rochester, NY) was the first museum to exhibit photographs from his first major series, Hitler Moves East, which effectively launched his career. Levinthal's work has been a touchstone for conversation about theories of representation in photography and contemporary art ever since. War, Myth, Desire is the first museum retrospective of his work in more than twenty years. The exhibition will include photographs from some of his major series, such as Wild West (1986-89), Barbie (1995-98), Baseball (1998-2004) and History (2010-15) - as well as works that have rarely or never been exhibited previously. See the available Wild West and Baseball photographs here. A.J. was commissioned to paint a large mural on the exterior of a home as part of the 2018 San Francisco Decorator Showcase. The mural consisted of three of A.J. 's signature bullseye circles. The circular designs that are common throughout her work symbolize individuals and their journey towards a more healthful, conscious life. See A.J. 's available paintings here. Nu Skin has purchased the work of three JNG artists for its corporate headquarters in Provo, UT. Two paintings by Sunny Taylor and two photographs each by Debra Bloomfield and Thea Schrack have been added to the company's stellar art collection. 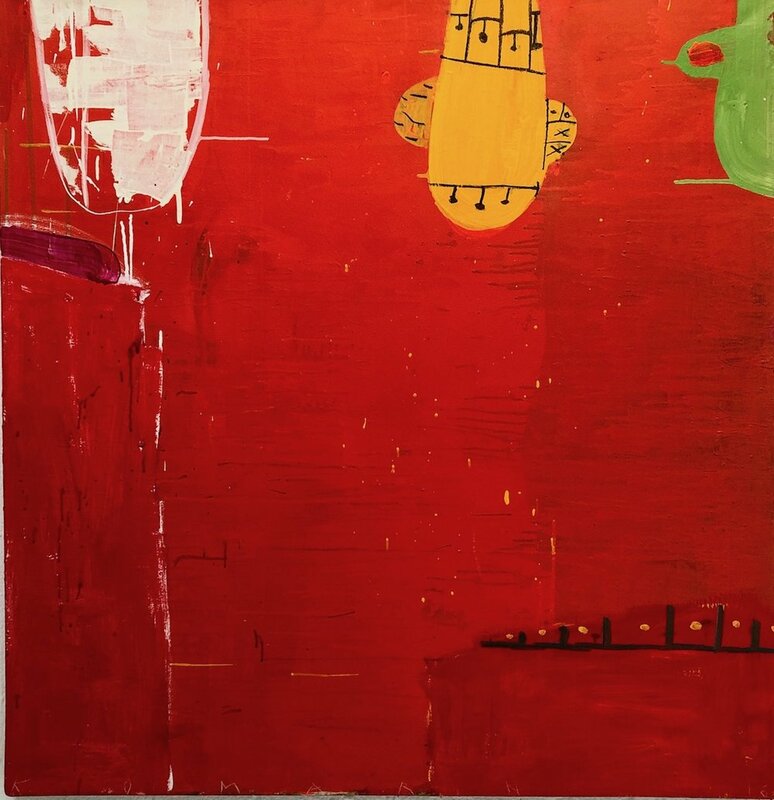 Sunny Taylor, "Rehearsal", acrylic on panel, 40" x 40". Geoff Wichert of 15 Bytes reviews Philip Buller's latest exhibition "Images of Ourselves"; read the full review here. Utah Climate Week (October 8-14) was created by the Utah Climate Action Network as a time designated to inspire and support conversation about the climate change issues in Utah. The Park City Summit County Arts Council has joined with art galleries throughout Park City to activate the arts and raise awareness of Utah Climate Week. JNG will be featuring select work by Brenda Mallory which was created from recycled materials. Mallory's creative process has been focused for many years on use of found and recycled scrap materials. The four featured artworks by Mallory were created from materials as diverse as linen firehoses, drive belts and corrugated packing material. The artworks will also be featured within a virtual gallery on the PC Arts Council web site. See Brenda's artwork here. Tor Archer's sculpture Virgin of the Snakes will be included in the exhibition Serpentiform at Art and Science Museum, Singapore (through Oct 15) and then at the Mori Arts Center Gallery, Tokyo (Nov 25 - Dec 23). All of the art in the exhibition has a serpentine element and will also include work by Robert Mapplethorpe, Keith Haring, Alexander Calder, Anselm Kiefer and Joan Miro (and others). See the available sculptures at JNG. The Museum of Fine Arts Houston will feature 44 photographs covering David's work from 1972-2016. In these photographs, the artist has staged toys and other everyday objects to bring viewers face-to-face with themes central to American history, identity and consciousness. The exhibition will run Oct 14 - Feb 18, 2018. See the available photographs at JNG. Hailed as "a triumph of ensemble playing" by the New York Times, Utah's own Fry Street Quartet is one of the most exciting and dynamic string quartets on the international classical music scene. Join us as the Fry Street Quartet embarks on a complete cycle of both the Bartók and Haydn opus 76 string quartets. Don't miss this opportunity to see these acclaimed musicians in an intimate and contemporary setting. Tickets: $20 if purchased by March 22 (use code JNG0325). $25 after the 22nd. Buy tickets here. Seating is limited. Wine reception included with ticket purchase.